I was lucky enough to catch a couple of vivid crepuscular rays making landfall a few feet in front of me when I visited the Peak District. We have started a new tradition this year. Rebecca has prepared an Advent Calendar where every day we all have to do something. Feel free to join in. 2nd December. Text, email FB or telephone someone that you haven't had contact with for a while. I haven't done it yet, but tonight I will be calling my old mate Neil from Uni (84-88) to arrange a visit to see him in Hull in February. I haven't seen him for 2 years. Fabulous shot Sean, instant fav, just love b&w photography. Fav and a follow. Superb shot. Wonderful landscape and clouds. 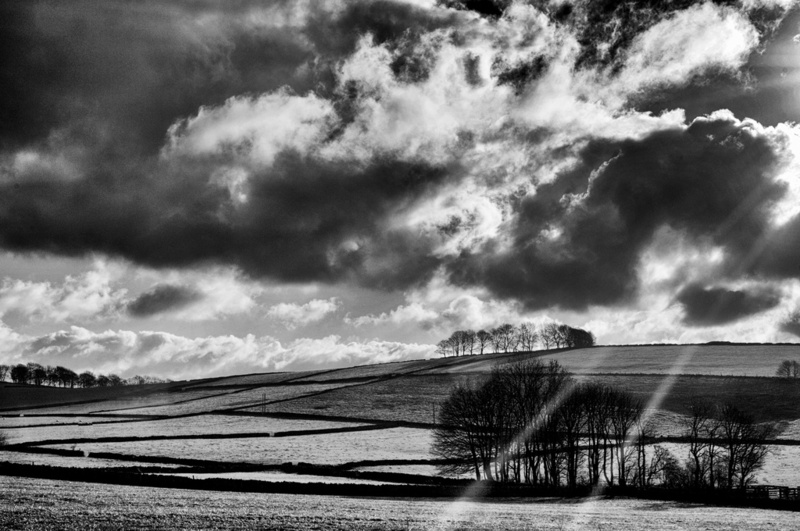 B/W makes a dramatic image, great rays. Fav. A very worthwhile Advent calender which makes you do stuff often put off! Rebecca sounds a very enterprising girl. The first time I have heard of crepuscular rays & it's saying I spelt it wrong so not sure what it means...can guess of course & they are lovely! Really super image of the Peak District. Fav. I think I have quite a good vocab. but you introduced me to this one a week or two ago: 'Crepuscular'! One to gargle with! ..and I'll ring someone, I haven't seen for two years since I had a (too big!) birthday exactly two years ago. Thanks, Sean. I have a brother in Hull - dreadful place to get to from Southampton! The Tigers did well yesterday! The rays are nice, but what I really like are the isolated groves of trees. I like your advent idea. I texted an old friend today...we'll see if I can keep up with the rest. @bluefirebucket Just luck Mick! The more shots I take, the luckier I get, to paraphrase a Mr G Player. Stunning and amazing capture. Timing is everything! Wonderful layers in this scene. The rays cutting through make it dramatic rather than peaceful for some reason. I like the array of your advent ideas, too. Brilliant, Love the rays of light. Love the depth and those rays of light! Can well see why this ended up op pp, such drama in the sky and great light. Lovely idea for the advent colour. Fav.